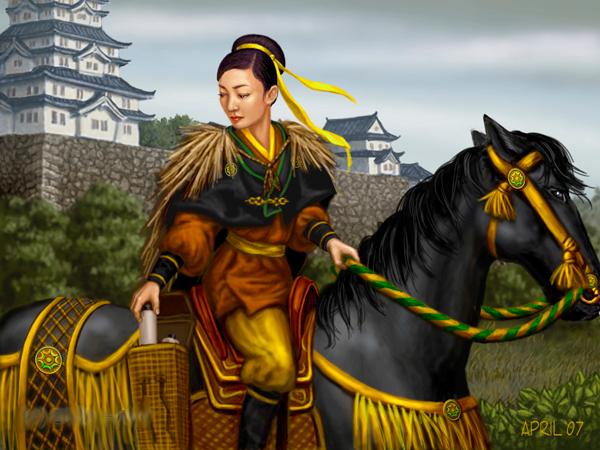 Miya Tomoko, the Imperial Herald for the Fallen Mountains, serves in the post that has been passed down by her ancestors since the Unicorn Clan reclaimed their territory in the region, triggering frequent skirmishes with the Lion Clan and necessitating the need for a dedicated Imperial presence. Like all heralds she serves the Emperor two fold, delivering missives and declarations to the citizens of Rokugan while constantly observing all that transpires within the region. Due to the numerous small villages and treacherous terrain associated with the Fallen Mountains Tomoko spends little time within Shirayama Toshi, a situation which suits her temperament and desire for a simpler life. As could be expected the numerous samurai of the city court see Tomoko’s position as one which can be politically exploited and during her limited time in the city she is frequently petitioned to endorse their positions or to carry worthless messages on their behalf. Only the Governor makes little effort to influence her actions despite the fact that as an Imperial appointment he could easily arrange for Tomoko to serve him directly. Tomoko’s desire for a simpler life extends beyond that of merely wishing to avoid the distractions of court. On more than one occasion she has found herself trapped within villages due to snow or landslides, during which times she has been forced to live amongst those beneath her in the celestial order. While most of the samurai caste would find themselves appalled by such conditions Tomoko found love in the embrace of a peasant who was not immediately cowed by her station or Imperial heritage. While such romances are the source of numerous pillow books across Rokugan if anybody were to discover it Tomoko’s position and perhaps even her life would be forfeit. More dangerous, perhaps, would be for a member of court to discover her secret. With it Tomoko would become just another pawn in the never ending game of political maneuvering, subject to the whims of those accustomed to trading the secrets of others. General: As a herald Miya Tomoko travels the region extensively, spreading Imperial edicts while also gathering news and rumours. In this position she could easily serve to alert PCs to unusual goings on or movements within the Fallen Mountains, though much of her knowledge is based on little more than hearsay and idle chatter. A secret to protect: Tomoko’s lover has become known to a member of the court and she begs the assistance of the PCs in gaining leverage over those who would blackmail her, all while trying to prevent the PCs from also discovering her secret.